What are the current issues and challenges in your life? Can they be fairly described as dilemmas? Or are they more like what we call a problem—which means there is a a solution? The answer helps reveal options and paths you can follow to navigate your way through challenges. 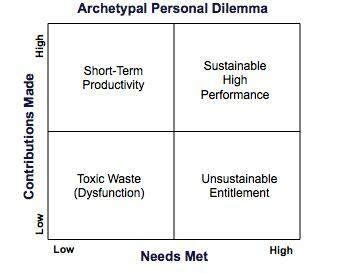 The archetypal personal dilemma is about tradeoffs between contributions and rewards. In our work environment we experience this as a dilemma between personal effectiveness and personal satisfaction. We all need to receive as well as give, and we have a drive to increase our personal effectiveness at work and achieve satisfaction in our personal lives. One of our students described this personal dilemma. He was a Chinese-American and had completed graduate school in the US. His plan had been to stay here and start a career. But after graduation his father’s manufacturing business in China suffered setbacks. The son suddenly felt unspoken family pressure to return to Asia and work in the family business. He was torn between the desire to help his father in the short term and his long-term personal goal of a successful business career in the US, which included more graduate school. He used the Personal Dilemmas method to clarify those parts of his conflict which were resolvable and those that were not. He ultimately decided that he could not give up his US life, but that he would take a two-year hiatus and work in North America in his father’s business, building up good experience on his resume while discharging personal and cultural obligations to family. 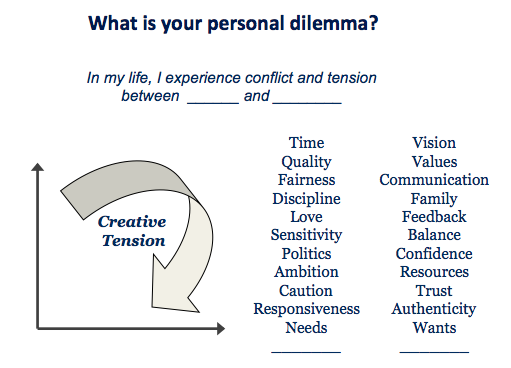 Dilemmas present tradeoffs between powerful conflicting forces in our lives. Urgency versus importance; cost versus benefit; what I want today versus what I need tomorrow. 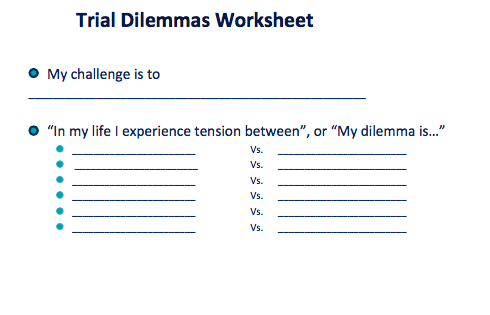 The goal of the personal dilemma assignment is to fairly describe those aspects of your current challenges that are dilemmas. Step 1 Write down one, or possibly two major challenges you face in your personal life. Step 2 Symptoms: Make a list of up to ten symptoms of the challenge. Answer these questions. What are you feeling? What is it like to experience this conflict? How does this challenge impact your life or the lives of significant others? Step 4 Take a look at the trial dilemma statements. Are many of them similar? See if you can combine similar items, Strive to choose two labels for the axes of your matrix that synthesize the most relevant forces at play in your trial dilemma statements. Step 5 Draw a 2 x 2 matrix and name your quadrants. 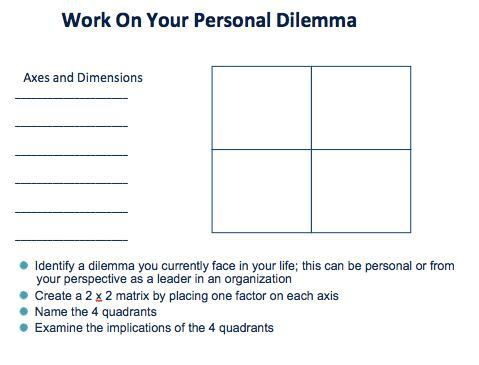 Giving a name to each quadrant helps us better understand what we’re facing, and take personal responsibility for the situation. See the articles What Makes Great Problem Solvers Different? and Dilemma Archetypes, for useful information.